The United States' Asia-Pacific Pivot continues to move full speed ahead, as the military continues to re-position existing resources from other regions and develop new bases and weapons systems to ensure containment of China and overall control of those we consider our adversaries (read competitors for strategic resources) in this region. Among the myriad changes are the naval base (in construction) on Jeju Island, South Korea that will serve (among other things) US missile defense destroyers and the shift in nuclear weapons toward Asia. We have seen a shift in basing of the OHIO Class "Trident" ballistic missile submarines from the Atlantic to the Pacific. Currently, of the 14 total Trident subs, 8 of them are based at Naval Base Kitsap-Bangor in Washington State, a definite reversal of basing from earlier Cold War days. The Trident nuclear weapons system has become what is arguably the greatest symbol of U.S. force projection around the world. It is absolutely the most powerful destructive force ever designed and deployed, and is indeed a formidable symbol of power projection. China has taken notice, and continues (with some difficulties along the way) to develop its submarine launched ballistic missile capabilities. China knows, however, that it's submarine fleet would be vulnerable to U.S. control of "choke points" around the region should a conflict ever develop. For many years, Hans Kristensen and Robert Norris of the Federation of American Scientists (FAS) have issued carefully researched reports on various nations' nuclear forces. In years past these valuable reports have been (or at least seem to have been) largely ignored by the mainstream media. That appears to be changing along with the tensions building in the Asian region due to continued U.S. military buildup. 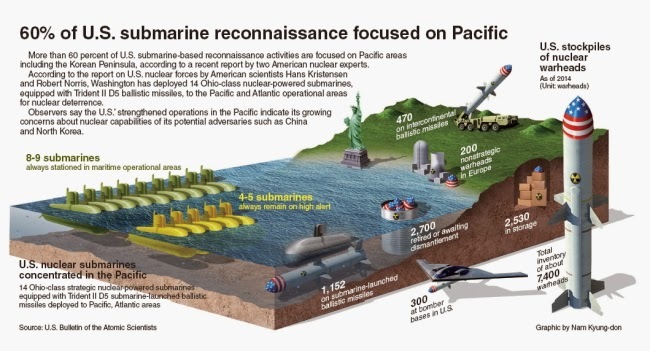 More than 60 percent of U.S. submarine-based reconnaissance activities are focused on Pacific areas including the Korean Peninsula, according to a recent report by two American nuclear experts. According to the report on U.S. nuclear forces by American scientists Hans Kristensen and Robert Norris, Washington has deployed 14 Ohio-class nuclear-powered submarines, equipped with Trident II D5 ballistic missiles, to the Pacific and Atlantic operational areas for nuclear deterrence. Observers say the U.S.’ strengthened operations in the Pacific indicate its growing concerns about nuclear capabilities of its potential adversaries such as China and North Korea. Key to the whole Asia-Pacific Pivot is the fact that it is driven by "national security" interests and is driven by a deeply embedded Military-Industrial Complex and archaic Cold War thinking. Nuclear weapons that, quite ironically, are central to the strategy of the pivot, are essentially useless as "weapons." Some of the submarines that patrol the Pacific are on 24 hour alert status, are prepared to launch their thermonuclear-armed Trident II D-5 missiles quickly, on command. Should our submarine forces ever launch any of these weapons, not only would those who are targeted be incinerated by these horrific weapons, but people of other nations in the region would be irreparably harmed as well. 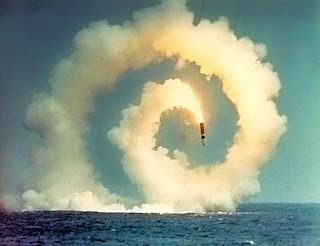 Nuclear weapons, once released, are uncontrollable in space and time. The effects simply cannot be contained, and even a limited regional war would be a disaster affecting not only the region, but would be felt on a global scale (as has been determined from studies of limited nuclear war between India and Pakistan). Essentially, nuclear weapons can never be used, and the U.S. is creating the very conditions by which they are most likely TO be used. Trident is at the heart of this dangerous game of nuclear risk being played out via the Asia-Pacific Pivot. At the same time, there is no apparent diplomacy going on among the nations involved in this dangerous game to reverse the nuclear danger. It is up to the U.S. to take the first step in this process and make a good faith effort to initiate discussions with Asian nations about reducing and ultimately eliminating nuclear weapons and their delivery systems. A critical first step, besides a pledge of No First Use, would be taking weapons of Alert Status. Having weapons on alert status increased the risk of accidental (and irreversible) launch of nuclear weapons during a crisis. Trident is an archaic, first-strike, Cold War weapons system that stays vital not only through shear inertia, but also by virtue of its extraordinary power as a symbol of U.S. force projection. The irony of this situation is that it is a weapon system that can (and must) not ever be used. The more tragic irony is that Trident is slated for replacement with an entire new fleet of 12 submarines, with construction beginning in 2021. This plan has been pushed through without any real debate about the issues of "nuclear deterrence" and what useful purpose Trident could serve for many more decades. Since the government refuses to engage in such a critical discussion and debate before entering into such an expensive ($100 billion estimated construction cost for 12 subs) and risky program, Ground Zero Center for Nonviolent Action is asking the tough questions and challenging New Trident. 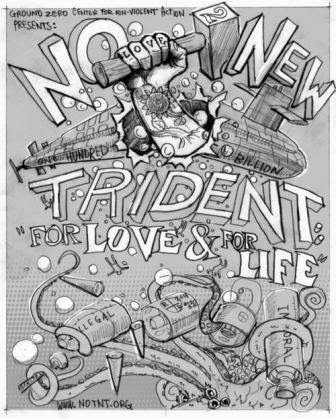 The NO To NEW TRIDENT campaign seeks to challenge the shaky foundation that underlies the Navy's plans and demonstrate that a new generation of Trident will by no means make the U.S., its allies, or the rest of the world safer. The continued deployment of thermonuclear weapons ready to launch 24/7 is a recipe for disaster. The only way to assure the elimination of the nuclear risk is to eliminate the nuclear weapons, and this can only come though dialogue with the other nations. Learn more at the NO To NEW TRIDENT Website/Blog at notnt.org. NO To NEW TRIDENT is a campaign of Ground Zero Center for Nonviolent Action (gzcenter.org)..
Click here to read US Nuclear Forces, 2014.